TULSI MALA (108 BEADS) The tulsi mala or a rosary made from the holy basil plant, is a beautiful thing to possess and wear. Hindus see the tulsi mala - the light, white chandan-coloured one as a way to connect to Vishnu or any of his avatars like Krishna and Rama. 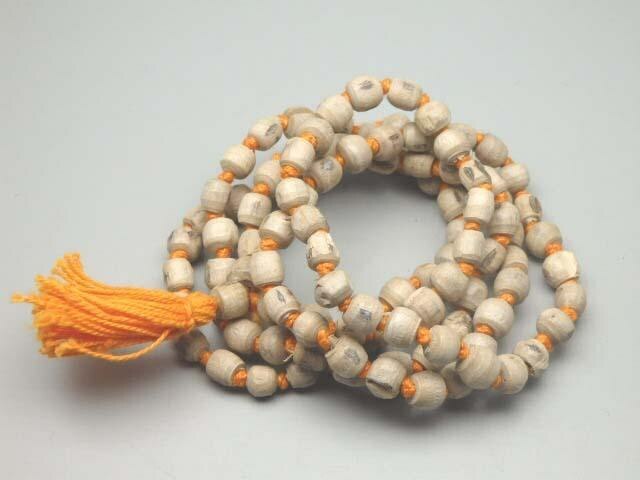 As soon as you wear the tulsi mala, around your neck or around your wrist, you feel protected and focussed. It actually goes a long way in helping you deal with the stress of modern life. If time permits, you can simply chant Hare Krishna Hare Krishna Krishna Krishna Hare Hare/Hare Rama Hare Rama Rama Rama Hare Hare. Some people believe that this mere chant is enough for salvation in this dark age called Kali Yuga. as per skand puran, those who wear neck beads made of tulsi after offering it to Shri Hari Vishnu definitely foremost among the devotees of lord vishnu tulsi is natural healer with many medicinal properties.It is powerful antioxidant and has purifying nature. it helps in dealing with the stress of modern life. it keeps mind very clam and peaceful. similar type of tulsi mala as shown in the picture shall be dispatched within 7 working days after receiving the confirmed order.